It's lovely to be back, I have finally replaced the broken laptop with a new typing friend. It's taking a while to get used to but I'm sure I'll will get the hang of it soon. I've tried my best to keep up with you all and have seen some lovely posts. So after laptop gate I have been mostly wedding planning and doing the never ending jobs an old cottage throws at you. 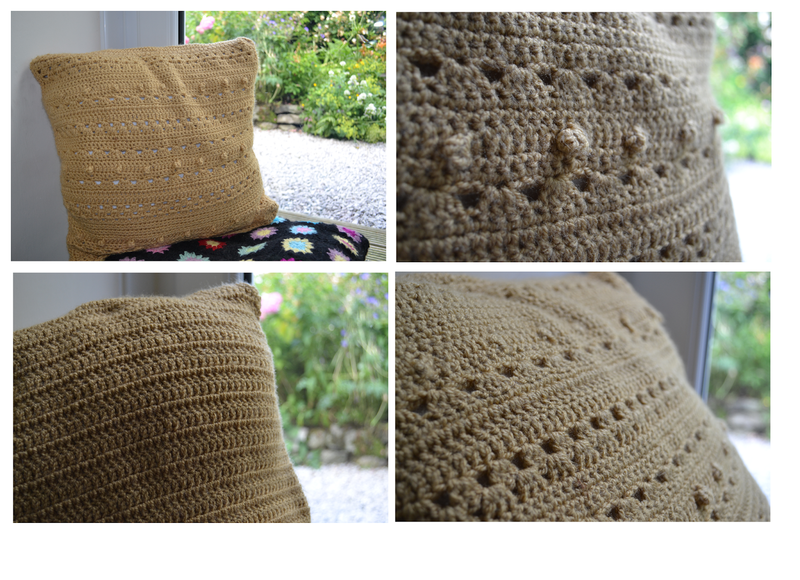 This my latest cushion made from the pattern in simply crochet issue eighteen with style craft Aran. 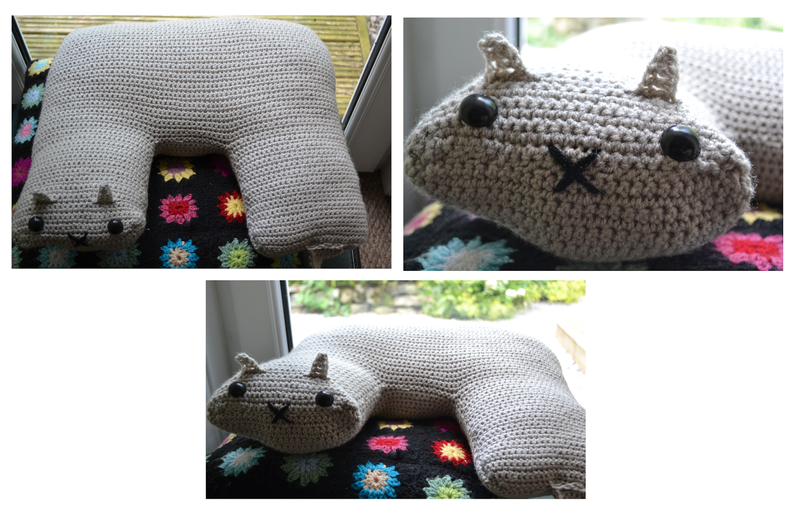 I really enjoyed swapping between the different stitches, I even did my first bobble stitch. The original cushion in the magazine is multi coloured and looks fab, mine is toned down a bit so I can use it in my sitting room. 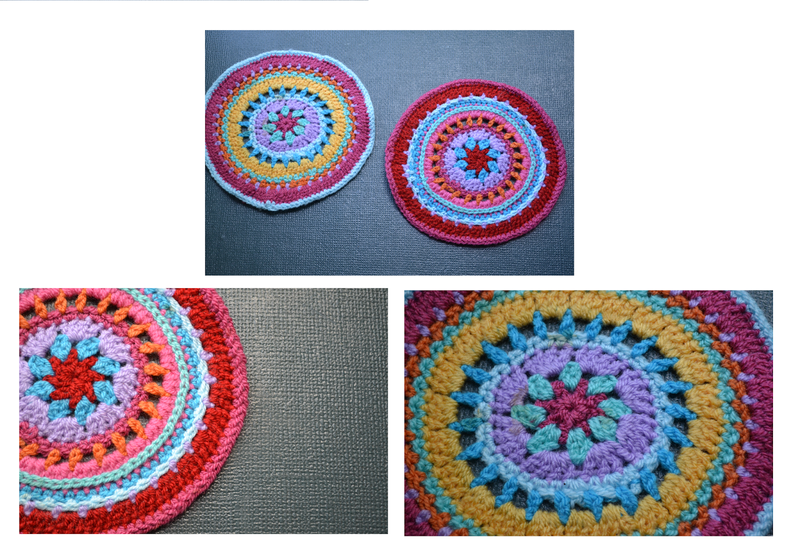 Here are some cheery mandalas. He took up a lot of double crochets but worth it in the end and is so snuggly. Cant wait to take him on his first car journey up to north Yorkshire to visit my Grandad. 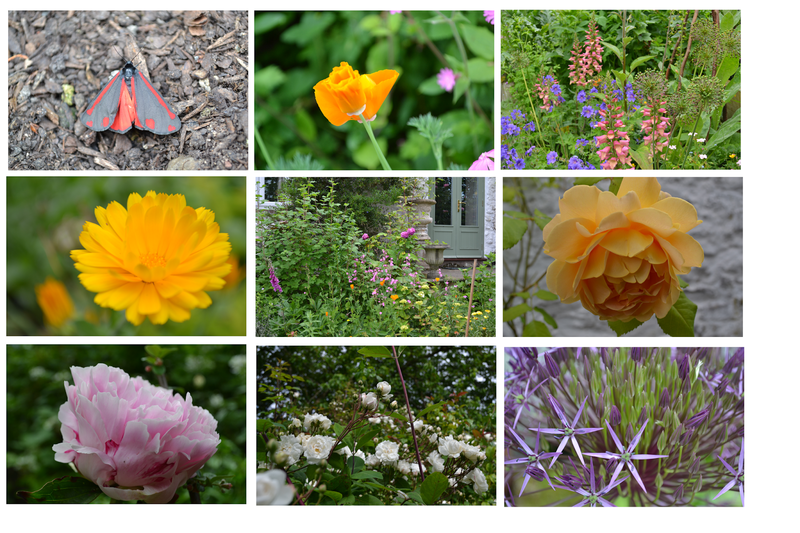 Here are a few photos from the garden. 5, A very full flower bed! Has anyone else's children/grandchildren been sucked into the latest craze of loom bands? My hoover isn't thanking me for all the strays she leaves behind! I will leave you with my pretty tea cup that a picked up a few weeks back and some garden roses. Wishing you a lovely end to the week. It's so good to have you back FB and to see your lovely makes; I'm loving your cushion and mandalas - the cushion is very classy - and your kitty cushion, my goodness, I love it! Enjoy your visit with Grandad and watch out, he may want that kitty to cuddle! You still remember me then haha. I know will have to watch my Grandad but he is more of a dog person so maybe I will get away with it. Aw your so kind my daughter really does enjoy making her bracelets. I know it will be here before I know it I'm bordering on stressed so will have to do plenty of crochet to keep me relaxed. Truly beautiful makes. I love the cushion. Time is flying by, not long to your wedding and only 5 months until my daughter gets married. Lots of exciting times ahead! I hope your daughter has a wonderful wedding and you enjoy a lovely day. Beautiful cushions and mandalas !!!! The flowers are lovely and the bracelet colorful !!!! Thank you Anna so sweet of you. Hi FB! You've been hard at work. Have you had your wedding yet? My kids love loom bands too. They're all the rage everywhere, I see. I hope you're doing well, it's lovely to see an update. Wedding is at the beginning of August so not long to go now. Thank you for dropping by. Your cushion is gorgeous. I've had my eye on that pattern but haven't got any further than that! Lovely cushions and mandalas! Your flowers are so colourful, and the loom bands are too :) Glad your computer is fixed, and good luck with your wedding plans. I love the cat travel cushion, it's fantastic. My daughter loves loom bands too!